Doctor Who got a new lease on life this year — not just in the sense of growing a new body, but also getting a whole new look and creative team. And now the results are a shiny DVD box-set! Looking at Doctor Who: The Complete Fifth Series on DVD, you're reminded of just how great an acheivement this year's reinvention was. Doctor Who started 2010 with an identity that had been burned into the public's mind in a way that the show hadn't managed since the 1970s. New producers Steven Moffat, Piers Wenger and Beth Willis shook up everything — new Doctor, new TARDIS, new companion, new theme-tune, new directors, new sonic screwdriver... even new Daleks. Everything gets bigger, including the brassy opening credits, the TARDIS control room and the Daleks themselves. And Moffat approached the fifth season radically differently than Russell T. Davies had the first four. The crack in the universe plays a much larger role, much earlier on, than any of the running themes in Davies' seasons. And the companion-Doctor relationship is a lot more complex, too — Amy meets the Doctor as a child, then again as an adult, and runs away with him on her wedding night, winding up in a love triangle with the Doctor and her fiance Rory, which then turns into more of a friendship among the three of them. Then something unspeakable happens to Rory, and when he finally returns, he's not himself, and he does something dreadful that he spends 2,000 years atoning for. It's a complicated story that verges on the epic, and Moffat spools it out over the course of just 13 episodes. 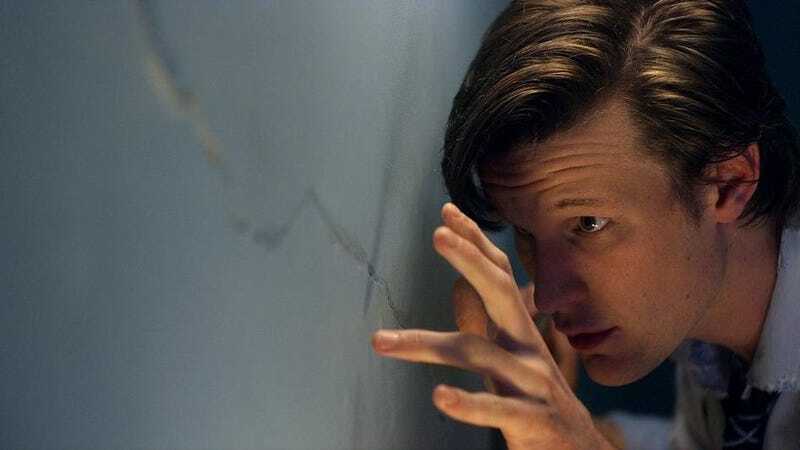 The other thing that you really notice when you're going through the whole season in a few sittings is how many little moments of cleverness and wryness Moffat and the other writers build into every scene. And just how much Matt Smith and Karen Gillan (and to some extent Arthur Darvill) are building into their characters, so that the relationships among the three of them become a lot more complicated and full of history by the end of the season. Rory and the Doctor become more like friends, and Amy sort of grows into her role as the woman they both care about more than anything else. The other thing that's more readily apparent when you consume large amounts of it in one go is that this is the most sitcom-like season of Doctor Who. There are moments of wonder and the occasional moments of pathos — a few incidental characters, like Father Octavian and Professor Bracewell, plus of course Vincent Van Gogh, get more pathos than the main characters do most of the time — plus, of course, Rory's torment at the start of "The Big Bang" is genuinely sad. But for the most part, the lever is kicked way over in the direction of "light and funny," even when the episodes aren't being laugh-out-loud funny. And just like when I watched these episodes for the first time, the only one I out-and-out love is the Vincent Van Gogh one, "Vincent and the Doctor." I often had a love/hate relationship with Russell T. Davies' writing — when it was good, it was almost too good to believe — but Moffat's writing is almost uniformly good, but never as mindblowing as something like "Midnight." Moffat also doesn't quite have Davies' gift for tugging at your heart-strings. Moffat aimed to craft a "fairy tale" season of Doctor Who — but they're fairy tales largely without wickedness. Where Davies used to revel in nastiness, Moffat seems a bit embarrassed by it — his stories often don't have clear-cut villains, and where there are villains, they usually turn out to be victims, or noble people who've gone astray. The thing is, though, wickedness is often (but not always) a key ingredient of fairy tales — as Moffat himself told me last year, we love fairy tales because they explain how to deal with the monsters. We need our wicked witches and big bad wolves. And it's not like children don't encounter evil, real evil, in their everyday lives — children get bullied, molested, thrown out of their homes by unscrupulous bankers, and lose their parents to pointless wars. Evil exists, and children suffer from it more than anyone. The closest we come to confronting real evil in this season is in the second episode, "The Beast Below," a story that actually comes out a lot better on a second viewing. In a very Davies-esque twist, the episode's "monster" is the human race, who are willing to torture an alien creature to escape from a planetary disaster — never realizing that the alien creature actually wants to help. And then there are the Weeping Angels, who gain more of a voice this time around but lose much of their bite in the process, sadly. As a collection of entertaining television shows, though, this box set is hard to beat. Like I said, the clever moments come thick and fast — both the amusing dialogue and the weirdly "out there" stuff like River Song burning a message onto a ship's flight recorder so the Doctor will know to travel back in time 20,000 years and rescue her as she jumps out an airlock. It's frenetic and mad and hilarious and thrilling, and I'm betting a lot of Doctor Who fan's lists of their favorite moments in the show's history are pretty heavily weighted towards this season. Most of all, watching season five will leave you even more desperate to witness season six, for a number of reasons. First, because now that Smith, Gillan and Darvill have settled into the role a bit more, they're going to have the chance to stretch out a lot more in their second outing — and I can't wait to see it. Also, a lot of the most fascinating mysteries of this season are deferred until next year — including what causes the explosion that leads to the crack in the universe, and who exactly is River Song. Both those mysteries seem like they'll be addresed next year, and season five will look either better or worse in retrospect depending on how they're resolved. There are the two "meanwhile in the TARDIS" scenes that show what happened in between "The Eleventh Hour" and "The Beast Below," and between "Flesh and Stone" and "Vampires of Venice." There are a few "video diaries" where Smith and Gillan take us behind the scenes, including Karen Gillan taking you on a tour of the TARDIS set and introducing you to random crew members. There are "Monster File" featurettes on the Dalek redesign, the Weeping Angels, the Silurians and the alliance of monsters which turns up in the penultimage episode. You probably won't learn too much new from those if you're a reasonably attentive fan , except there's a handy guide to every monster that turns up in the big "Pandorica Opens" crowd scene. And there are "in-vision commentaries" on a handful of episodes, where the stars, producers and directors appear in a little box and give their thoughts on the episodes. Stuff I learned from those: there's a bit of a goof in the opening episode, as the TARDIS flies over London and it's supposed to be 1996, but the Millennium Dome has already been built. Also, Matt Smith's hair changes drastically from scene to scene in "The Time of Angels" and that episode's beach scene was originally much longer and included a speech that was used in Karen Gillan's audition, about Amy's first time on an alien planet — but the tide came in too soon. And Steven Moffat is fond of saying he'll leave various little glitches "to be explained by my successor." And there's a disc with all the "Doctor Who Confidential" featurettes that aired (in the U.K. at least) after the episodes, and all of the BBC "idents and trailers" that aired around the show. All in all, it's a nice sturdy package, and a good presentation of a season that reinvented Doctor Who yet again, and contained some of the most ambitious storytelling in the show's history. Check it out!